Old School, New Twist: A Board Game Preview of "Pegged In"
I used to be a frequent visitor to the fair city of Nottingham, as my other half was living there for a good while. Now she’s moved up to sunny Sheffield with me, visiting our friends in Nottingham has sadly become a rare trip. On my last visit however, I was fortunate to be taken to a lovely little venue that made the visit all the more special. Turns out, it’d only just opened – it’s called The Dice Cup, and I’ve been in touch with the guys behind it for a little interview. The team behind it are; myself, Matt. I’ve done many things in my time and could probably be described as a jack of all trades, but a master of boardgames, so when the time was right to make this move, I went for it. David has been the proprietor of Mondo Comico for about six years and before that he was assistant manager at Travelling Man. Steve is a maths teacher who introduces his school kids to boardgames as they often require mathematical and/or analytical thought. He is also an ex-pro poker player and regular bridge player as well as being active in the Nottingham boardgame scene. A shot at the entrance end of the store, where you’ll find the coffee, comics and other for-sale stock. Head up the ramp behind shot, and that’s where the Magic (The Gathering) happens. Opening weekend went well. 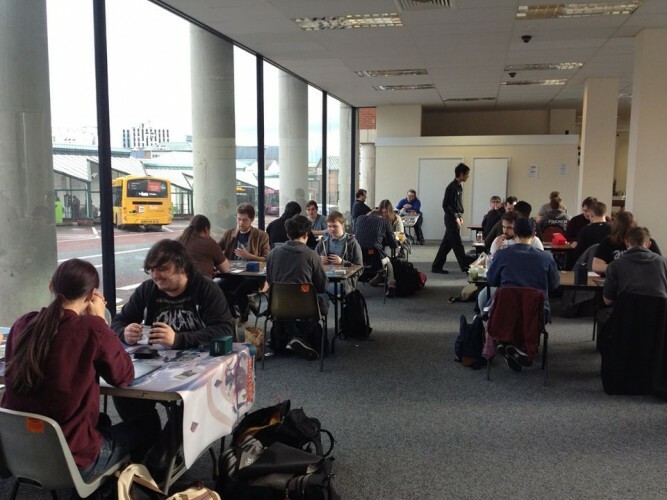 We had a full house on Saturday and even had to break out some extra tables! The cafe itself is founded on principles of inclusion and openness. One of the issues with the boardgame scene had been that although it was thriving, you only saw that from the inside. 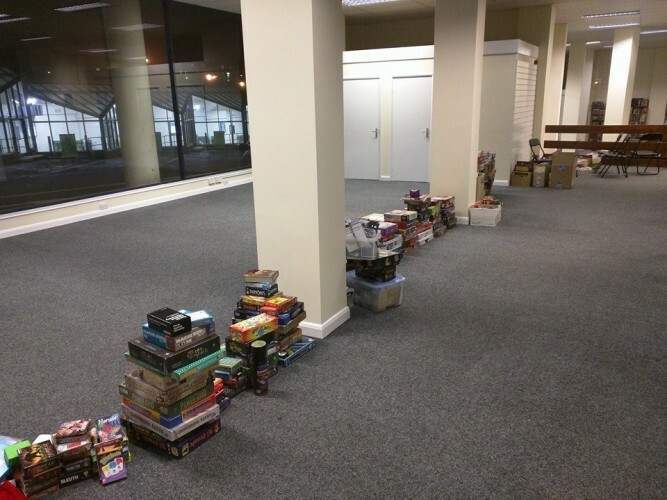 We wanted to open a venue which really showcases what boardgames are about. Our cafe is fully wheelchair accessible and if you’ve seen our big windows, you know how open it is. Glass front and back, its Geek Pride at its finest. These must be the backup tables, because when I was there, it was nothing but top quality GEEKNSON gaming tables. 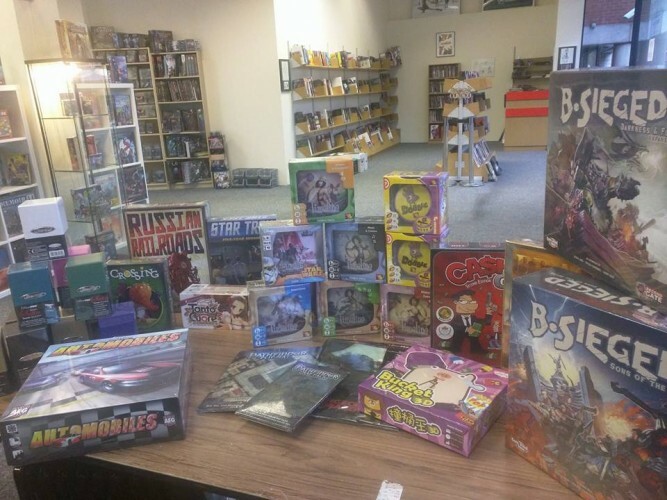 We get a lot of passers-by popping in and discovering that boardgames have evolved in every possible direction and now have something for everyone. From quick games to fill 5 or 10 minutes, to long strategic epics that will fill the whole day, even with new ways to play like social deduction, cooperative storytelling, pattern matching and reflex games. We have Some Curse of Strahd D&D Campaigns starting this week and we’re looking forward to Shadows Over Innistrad. We’ll have a midnight release event for that! Taken from their setup photos – not with some fancy wide-angle lens. The Dice Cup is massive – and I was impressed by the toilet facilities. You can’t say that about a lot of places. Our ongoing Magic events every Wednesday and Friday, as well as Game Days and pre-releases as and when. 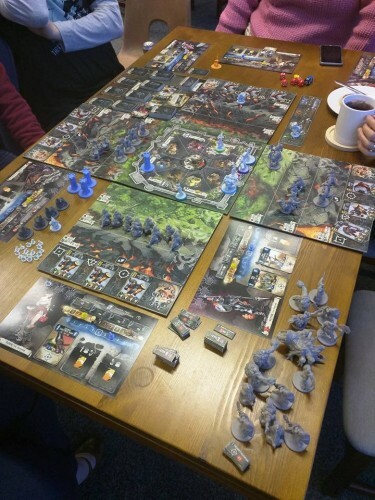 Other than those, we have a regular board game night on Thursday every week with the FANG gaming group which is open to anyone to come along and play, and on Monday’s we have Star Wars night – anything in the Star Wars universe goes, X-wing, Armada, the LCG, Imperial Assault, etc. Mostly it’s X-wing and Armada so far. As we move forward, we will be adding more regular events as well as one-off events like the Conan RPG Demo we have on this Tuesday night (15th). The veganness is my influence. There are a large number of reasons for us to be vegan. Inclusivity, environmental reasons, and compassion. The menu has now got a few extras on, such as wraps and calzones, and there will be quite a few more additions once the work on the kitchen has been completed. We’re planning to have chili, soups, burgers, kebabs, pies and more. All vegan and all delicious. Play Games. Sell Coffee. Profit. Its just good business. Our mission statement is to promote learning and social cohesion through board gaming, providing a safe place to play for people from any background or age group to come together and interact. Equally important is that we build and maintain a social, ethical, sustainable and environmentally conscious relationship with our customers, suppliers, partners, community and our planet. Head over to The Dice Cup’s Facebook Page or official site to find out more info on current news and events – or take a trip to Nottingham and see the place for yourselves. Now they’re through the opening phase there’s a small charge for access to their insanely varied library of games, but if you were going to a bar you’d pay as much for two games of pool and it wouldn’t last you the whole day – even my ingrained Yorkshire tightness can’t argue with that. I love this place – and if you read this website, then I guarantee you will too. A twenty-something Yorkshireman, Tom "Mage" Sorsby enjoys long walks through fantasy realms, nail-biting space battles and defeating Rome as the Iceni.